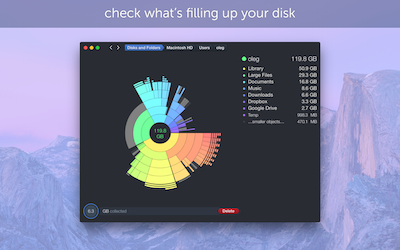 We are thrilled to announce that the long awaited major update DaisyDisk 4 has been just released and is now available both on our website and in the Mac App Store. The update is free for all existing customers of DaisyDisk 2.x – 3.x. Finally, brand new look-and-feel, matching the new OS style. Dramatically improved scanning speed – up to 20x times faster! Now scanning takes just a few seconds, not minutes as before. (Depends on your disk and CPU models. The speed gain is most notable on newer SSDs and 4-core CPUs). A few minor features and tweaks. Note: All localizations except English have been temporarily removed in this version, to speed up our development. We will re-add them in future minor updates.